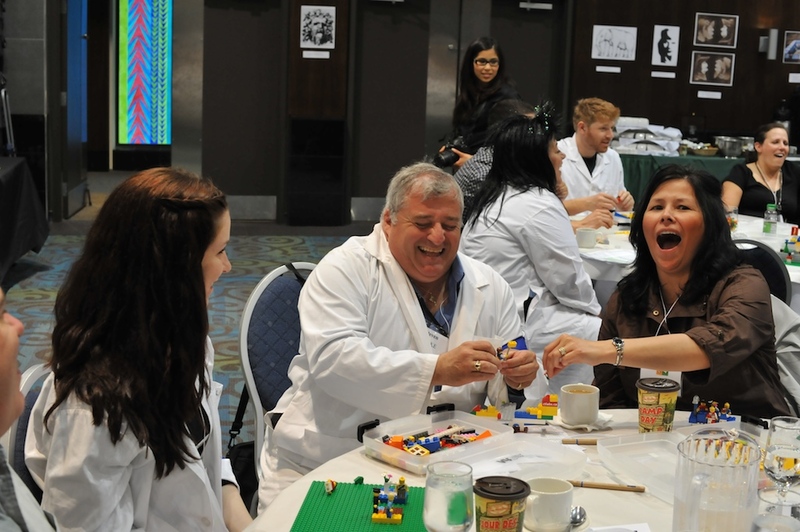 Lego Serious Play (LSP) is a wonderful process that was designed to enhance deep, innovative conversations among intimate groups of 8-12 people. As a creative problem solving process for small teams that are solving huge challenges, it is unmatched in its support of lateral thinking and metaphor building. So what were we thinking when we designed an LSP workshop for over 200 participants? Not exactly the most intimate gathering. But we’re accustomed to taking groups of 100 or more towards useful outcomes, so the question was: how could we best tie in the LSP methodology with everything else we knew and loved doing with complex human systems? Figure 1 Our Lego Kits – play for 220!! We worked with our client core team to develop an intention question – a single unifying question that would situate all of the conversations, all of the work, all of the activity on the day. Then we worked in our own core team to figure out how Lego could enable richer answers to this question. It turns out that Lego for 220 people is not the simplest thing to arrange, logistically. 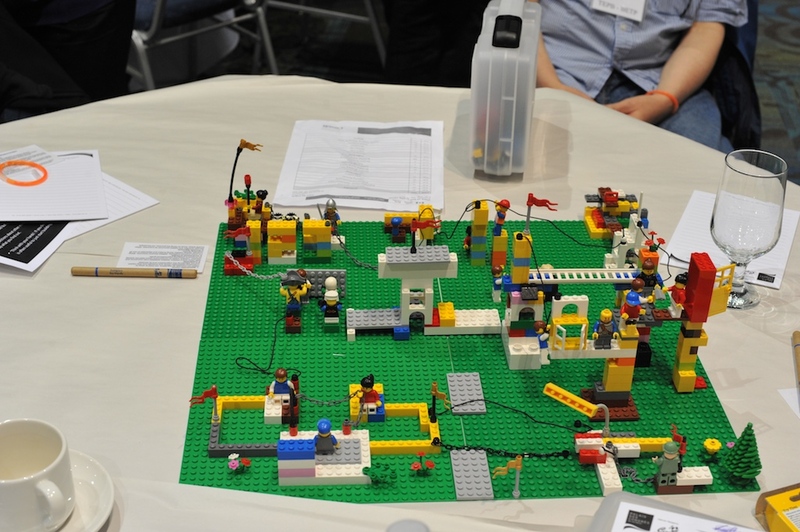 We used our own custom-designed kits, rather than the stock LSP kits in order to support the “vocabulary” we required – we had to choose Lego pieces that supported the needs and goals of our client base. What this means, of course, is that we had to source all of the pieces for our kits. And let me tell you, finding 120 nets, 240 ropes and 480 white picket fences was not a simple task! Our Lego orders came in from a dozen different countries, and our kit assembly process overwhelmed our office space, as you might well imagine! And of course, the last order, which contained over 4000 of the 35,000 pieces of Lego we would need for the event, got stuck in customs and showed up two days before the event was to begin. Happy days! On the morning of the event, we showed up with our supplies – 115 kits (5 extra – be prepared to be surprised! 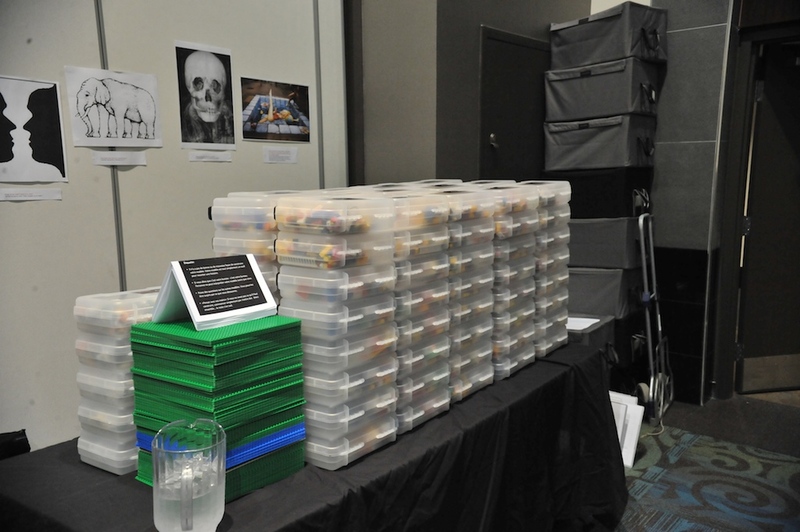 ), 115 base plates, 400 extra minifigures, and a team of four – we were well prepared. And we were curious – we’d never used LSP with more than 50 – how would 200+ work out? The short answer was – it was simply brilliant. As the lead facilitator guiding the event I may not be the most objective person to say this, but it was truly beautiful to watch unfold. Figure 2: A sea of people – all enjoying the challenge and the joy of Lego Serious Play. Participants fell easily into the discovery process, and shared openly with their tablemates (we sat 8 people to each round table) – and beyond. We watched a vast sea of human beings – from early 20s to late 60s – all personality types and a vast cross-section of occupations – learning, remembering, and playing. The laughter was wide-spread and heart-felt. We wandered from table to table, watching storylines unfold. We were amazed at how often we saw someone, head thrown back, in full belly-laughter. 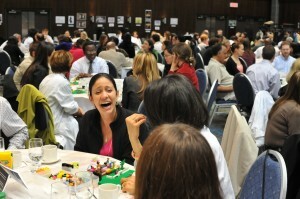 Figure 3: The laughter, and the insights, flowed freely – all day. Many of the participants built exquisite models – to this day, we are amazed at what people DO with the Lego that we would never have considered doing – and I wonder at the extent of human creativity. We inquired about many of the models that we saw through the course of the day, and participants were ever eager to share their stories. And as we provided them large baseplates to build from, we watched as models travelled, platter-style, around the room, as participants shared their stories far and wide. Figure 4: It was wonderful to watch the stories travel around the room. Following the LSP methodology and building it within our own practice of building incremental logic flows, we took the participants through four rounds of builds and storytelling. At the end, we provided them with two challenge questions: Based on everything you have done, and everything you have learned, what are the two most important things you need to tell your Assistant Deputy Minister? Each table had two 11×17 sheets of paper, and could provide two answers. In less than five minutes, we had 56 key recommendations posted on the wall. There was the sense that 220 people had worked together to find a collective voice, to assess and provide initial thoughts on solving a key challenge – what were the most important things they could do to move forward smartly in their highly challenging work environment? Figure 5: The interconnections between the models – at the literal and figurative level, were rich and complex. We’ve taken thousands of teams through this discovery process, but this day was the first time we worked a team this large with the support of the LSP methodology. 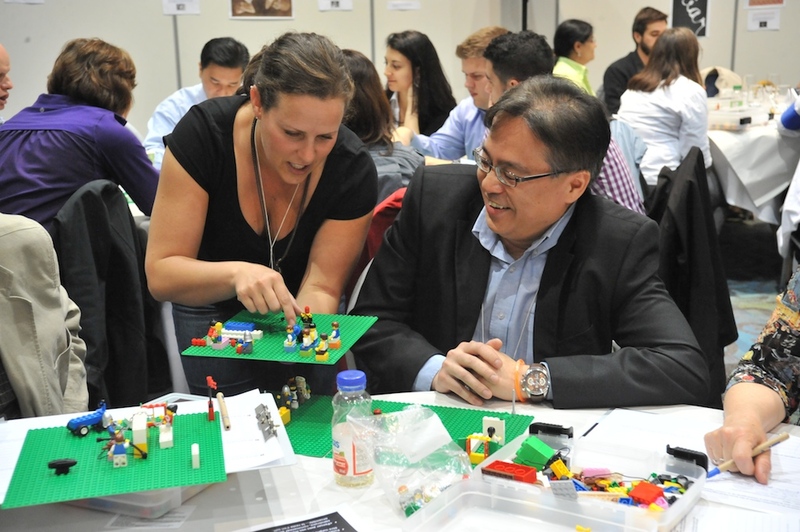 There were many learnings on the day – for us as well as for them – but my key learning was the strength of play in supporting three key attributes: speed to trust, complex retention, and extreme innovation. We still have many clients, current and potential, who scoff at the idea of plastic bricks scattered across a tabletop. But I ask them – when you watch a child at play, do you think there is ANYTHING inconsequential in their activity? If yes, then I suggest you look more closely. Play, and in this instance, Lego Serious Play, engages us in a way that conversation alone simply cannot. The next time you have a really difficult challenge – a truly “wicked” problem that just can’t be managed into submission – please, invite your best friends over. But don’t invite them to struggle with it – invite them to play. You too may be very pleasantly surprised with the results. Interesting about trying to anticipate what “vocabulary” pieces the group will want – how often does it turn out completely differently? The Lego “vocabulary” is an interesting phenomenon. Two things happen. First, whatever pieces we point out to them in the kits and ascribe potential meanings to inevitably get used in that fashion. Additionally, and particularly with larger groups, we find table-specific vocabulary develops. The number of “rounds” of question-build-tell, the table tells and the room tells are all ways to trying to extend the common vocabulary. Flowers and shiny/clear pieces are almost unanimously used to demonstrate health/clarity in a system. The treasure chest we added is again, almost unanimously used as just that – the treasure chest – the place they are aiming for. One of the funny things is the unexpected…we asked one group of 35 to build their current office environment and had to ask why 17 of them built their models with their “selves” chained to their desks!